Judges of the Federal High Court in Abuja Monday shunned court in solidarity wit one of the colleagues arrested by the Department of State Services (DSS). 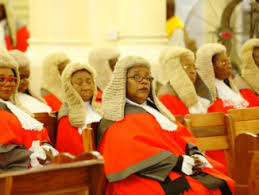 One of the judges arrested during last Saturday’s raid by the DSS is Justice Adeniyi Ademola, who sits in Court 7 of the Federal High Court, Abuja. Litigants, whose cases were scheduled for Monday, were disappointed when, on getting to court, they learnt that the judges would not sit. Some of the major cases affected were those involving former Chief of General Staff, Alex Badeh, former Imo State governor, Ikedi Ohakim and the case filed against the House of Representatives by Shell Nigeria Exploration Production Company Limited (Shell). Must Read- Biafra: Buhari’s Dogs The DSS Alleged Arrested Judges Has Been Granted Bail: But Why Was Corrupt John Tsoho Not Arrested? Ohakim is being tried before Justice Ademola on a three-count charge of money laundering and false asset declaration. He is accused of purchasing a property at 60, Kwame Nkrumah Street, Plot No 1098, Cadastral ZoneA04, Asokoro District, Abuja with cash payment of $2.29 which was said to be dollar equivalent of N270m in November 2008. Ohakim was also accused of failing to declare the property as part of his assets when asked by the EFCC to do so. He was to open his defence Monday, but for absence of the trial judge. No date is fixed yet for the case. Badeh and a company, Iyalikam Nigeria Limited are being tried before Justice Okon Abang for allegedly diverting about N1.4billion belonging to the Nigerian Air Force (NAF) between January and December, 2013, an offence which contravenes Section 15 (2) (d) of the Money Laundering (Prohibition) Act, 2011 (as amended) and punishable under Section 15(3) of the same Act. Trial was expected to continue Monday. Shell is challenging the jurisdiction of the House of Reps to investigate the process leading to the allocation of oil wells to it. It is also the company’s contention, in the suit marked: FHC/ABJ/CS/443/2016, that the planned investigation was subjudice as a similar case filed earlier by Malabo Oil was still pending before the court. Hearing was to open in the case Monday before Justice Abang.